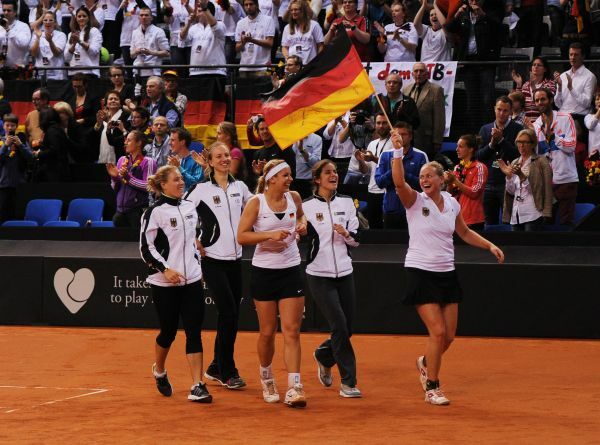 German women’s tennis can continue to count on the support of Porsche in the future. The automotive manufacturer has extended its contract as the Premium Partner of the Deutsche Tennis Bund (DTB – German Tennis Association) and the sponsor of Porsche Team Germany and Porsche Talent Team Germany for a further three years until 2017. Porsche Team Germany and its world class players like Angelique Kerber and Andrea Petkovic will contest the Fed Cup final in Prague on 8/9 November and can win the title for Germany for the first time in 22 years. Porsche Talent Team Germany has been successfully supporting Germany’s top up-and-coming youngsters since 2012. “In partnering the DTB, we wanted to generate a new dynamism within German women’s tennis and ensure German players are also successful as a team. It’s something we’ve managed to do,” said Bernhard Maier, Board member Sales and Marketing of Porsche AG. “Reaching the Fed Cup final is a fantastic achievement. We’re keeping our fingers crossed for Barbara Rittner and her players and hope they’ll return with the cup from Prague.” As sportiness is an important element of Porsche’s DNA, Bernhard Maier sees it as being only natural that the company is also involved in sport away from the race track. The centrepiece of the involvement in tennis is the Porsche Tennis Grand Prix, the world’s longest-standing indoor tournament and one of the WTA Tour’s marquee events. Porsche Team Germany players have won five WTA tournaments to date this year – Andrea Petkovic in Charleston and Bad Gastein, Mona Barthel in Bastad, Sabine Lisicki in Hongkong and Annika Beck in Luxemburg. The positive trend to be seen amongst the young players supported within the Porsche Talent Team set up was crowned by Anna-Lena Friedsam winning her first WTA title in Suzhou/China. Carina Witthöft has broken into the top 100 in the world rankings. The partnership with the Deutsche Tennis Bund that came into force in 2012 is an essential part of Porsche’s sponsoring concept which covers every part of society. Thus the company is also the partner of the world famous Stuttgart Ballet and the Leipzig Gewandhaus Orchestra under the banner “Premium meets Premium”. With the message “Turbo for Talents”, Porsche and the second division football club RB Leipzig recently started a trendsetting partnership focussing on youth support at the location in the federal state of Saxony. In the Porsche Basketball Academy in Ludwigsburg – a cooperation involving 11 partner clubs and 55 partner schools – about 2,500 children from the region regularly play basketball under professional supervision. Porsche additionally supports junior activities in sport clubs in Baden Württemberg and Saxony as well as a variety of scientific and charity projects. By sponsoring a broad spectrum of activities, Porsche wants to further embrace its social responsibility within society.